It’s impossible and detrimental to your catering profits to put all catering customers into one pile. The catering client who calls you for box lunches may need a drop off buffet, a cocktail party for the holidays, an employee picnic in the summer, etc. In the world of corporate catering, there are three primary catering opportunities; lunch, afternoon snack and breakfast. More and more companies are opting to cater in breakfast meetings to cut costs or to be more efficient with people’s time. 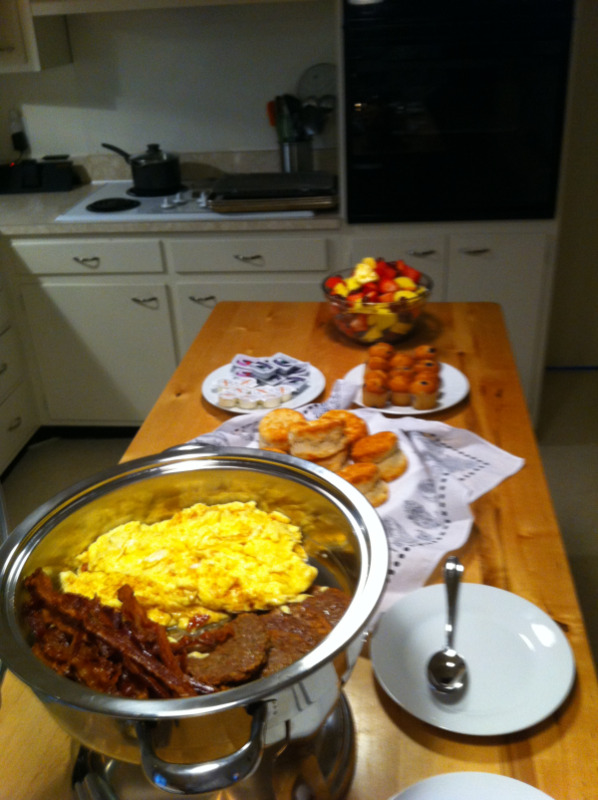 If you’re catering a breakfast meeting, you can get people to come in an hour early. I attend a regular monthly breakfast meeting for my CEO Roundtable. Most breakfast catering menus offer some type of egg dish/entrée and a meat…like bacon or sausage. When it comes to our barnyard friends, the chicken is involved in the breakfast, but the pig is committed. Are you a pig when it comes to catering? More specifically, are you committed to making your catering profit center a source of additional revenue? The other day I was conducting a consulting demo call for a gentleman from outside Chicago. He told me he was very interested in building his catering sales. On a one-on-one consult demo I review catering menus and websites. I also walk each person through all of the steps needed to build a profitable catering business out of their restaurant. It turns out this prospect really wanted to build his catering business, but did not want to invest $347 a month to have all the tools to do so. Whether he works with me, recruits away a catering salesperson, hires an ad agency or employs a high priced consultant, there is always an investment to build a business…especially a new one. Even if you choose to figure out yourself, there is still time and money to be invested. I asked him how much it cost to get into his restaurant. He told me all in, just under 4 million dollars. I’m a little confused. You invest 4 mill and have no idea whether your restaurant will succeed or not. Heck, if you picked a bad location, you’re stuck. But investing $347 a month for a step by step system to build your catering business is a big deal? And no, I don’t think this guy was struggling to make this week’s payroll. Profit comes after investment in the dictionary for a reason. We must all make investments to start and grow our businesses. A catering profit center does not happen in a vacuum. I must chalk it up to being chicken. I don’t mean yellow bellied. I mean this guy only wanted to be “involved” in catering by talking about it. My most successful clients are pigs! They are committed to catering, have a vision, burn their boats at the shore and never look back. Like Sean. He became a client less than a month ago and hit the ground running. Anything he needs to work on, gets done quickly and well. He is always ready for the “what’s next”. It’s this type of attitude that winners exhibit.